Although it has been snowing sporadically this month, our recent days of very, very warm weather tell me spring has arrived. As a result, I am watching the roadsides for the first flowers of spring. Even before the snow is out of the woods, it begins to melt along the roadsides as they warm in the lengthening hours of sun. And the cycle of bloom begins again. Coltsfoot (Tussilago Farfara L.) is one of the first plants seen in early spring. It forms large patches in waste areas, beside brooks and roads, and on damp hillsides. People often mistake Tussilago for Dandelion, but it is quite different. Its yellow flowers are borne on scaly, leafless stems. The large, woolly leaves don’t appear until later in the season. In spite of its early appearance in spring, Tussilago actually has late flowers. The flower buds are formed in autumn at the base of the plant, and pass winter underground, flowering in the first spring sunlight. Other names for the plant are Son-before-the-Father, which refers to the appearance of flowers before the leaves, and pas-d’âne (literally donkey-steps). The scientific names are from the Latin tussis, meaning a cough, referring to the use of the plant as a remedy for such ailments, and the Latin word for coltsfoot, farfarus. The plant was named by Linnaeus, the Swedish botanist who established the present day system of naming plants. Although the plant was used by pioneers for its medicinal effects, it is now known that Tussilago contains harmful alkaloids. Tea made from Coltsfoot has caused health problems in infants and pregnant women, so its use as a cough remedy is not recommended. In some States, Coltsfoot is considered a noxious weed. Published as: ‘Coltsfoot’, Winter 1993, The Antigonish Review 92:76-77. I discovered a big patch of coltsfoot blooming in a ditch last week. I thought they were dandelions at first, but the asparagus-looking stem gave it away as coltsfoot. Love the drawing. I can almost see the yellow in the flowers. 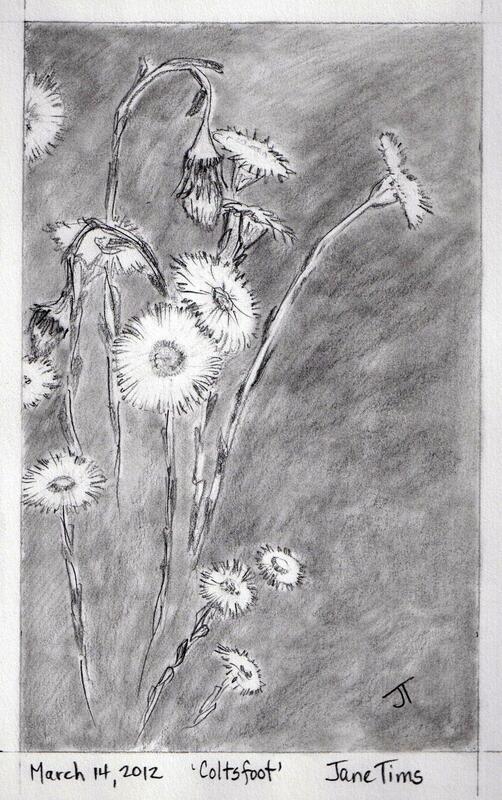 Wonderful verse and drawing- I saw a patch of these last week and had that very same ‘dandelion?’ reaction! Aha, I know exactly the flower you are paying tribute to, and I never knew its name. Edifying as well as enjoyable post. Your pencil drawings continue to inspire! Very, very nice indeed. Love the illustration, too.